Films can be, and are often, classified as a qualifying activity for the purposes of applying for advance assurance and raising funding pursuant to both the Seed Enterprise Investment Scheme (“SEIS”) and the Enterprise Investment Scheme (“EIS”). SEIS can be a significant help for start up film companies (as with other qualifying companies) who are looking to attract early investment. Very often, once a company has raised the SEIS limit of £150,000 such funding is combined with further finance provided by EIS investors, subject to a small time gap (to be reflected in the paperwork) between acceptance of the SEIS and EIS monies. The film maker sets up a production company after film rights in a script are secured. Note that founders who own more than 30% (together with any family member) of the company will not be eligible for SEIS or EIS. Investors then put money into the company for the purposes of producing a film. If the company qualifies, applicable SEIS/EIS tax reliefs will apply and the company can also claim other reliefs such as film relief. A subscription agreement should clearly set out the process of exchange and completion in respect of raising the funds and the company will need to ensure that it receives the investment monies prior to issuing the new shares (and the documentation is dated correctly). The film gets released and royalties are collected by the company. The investors will receive their share of any dividends declared. The company could eventually be liquidated or sold, although note that the SEIS and EIS investors will need to have held their shares in the company for at least three years for the tax reliefs to apply and their to be no capital gains tax on any sale or liquidation. On the liquidation of a film production company, note that the SEIS or EIS investor should not normally lose their income tax relief received on subscription. Also, loss relief could be claimed if a loss is suffered and the shares have been held for at least three years. Companies which are founded in order to produce just one film may not qualify for SEIS and EIS. This is because such companies are set up with a short-term goal and therefore are not perceived as providing a continuing stream of taxable income. The aim of the SEIS and EIS schemes is to facilitate the long term development of businesses so in order to qualify a film production company will need to satisfy HMRC that it aims to create an established brand with ongoing revenue streams. 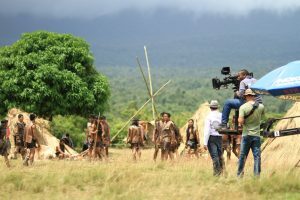 Film companies will often spend the SEIS and/or EIS monies raised for the production of several different films (by the one company) which are all in early development. It is not necessary to shoot all or part of a film production in the UK to be eligible for SEIS. Although film companies which have filming locations in several countries should bear in mind that SEIS/EIS applies to UK companies or companies with a UK establishment. HMRC’s guidance on what constitutes a ‘permanent establishment’ can be found here. The new “risk to capital” condition became effective on 15th March 2018 and depends on a “reasonable view” being taken as to whether an investment has been structured to provide a low risk return for investors. The condition has two parts: (i) whether the company has objectives to grow and develop over the long term; and (ii) whether there is significant risk that there could be a loss of capital to the investor of an amount greater than the net return. This new legislation is intended to target single purpose film production projects with limited growth/return. HMRC recently published guidance specifically relating to film production companies and the risk to capital condition, see example 3 here. Recent applications we have made to HMRC appear to confirm that since the aforementioned risk to capital condition came into force film and TV companies are finding it very hard to qualify for SEIS and EIS. Particular care needs to be made when applying for advance assurance to show how the HMRC guidelines mentioned above are complied with and the company is not operating on a ‘project basis’. This starts with the company’s business plan which should be written from the outset to comply with the aforementioned ‘example 3’ guidelines (not re-drafted to try and fit in and around them). We recently received a rejection from HMRC in respect of an advanced assurance application we submitted for a film production company several weeks ago. Before we submitted the application we had re-worked some of the company’s business plan to try and make the way it was structured fit in and around the new rules relating to SEIS and EIS. I share below the reasoning given by HMRC why the application was rejected. Increasing the number of employees. It appears from the information provided that the company will make films through various subsidiaries and that they would be made one after another and for similar budgets. From the information that has been provided, I am not satisfied that the company would grow and develop in its own right in the long term. Whilst the company continues to work on a project basis longer term, it is HMRC’s opinion that it is likely that the anticipated investment will not meet the “risk to capital” condition.